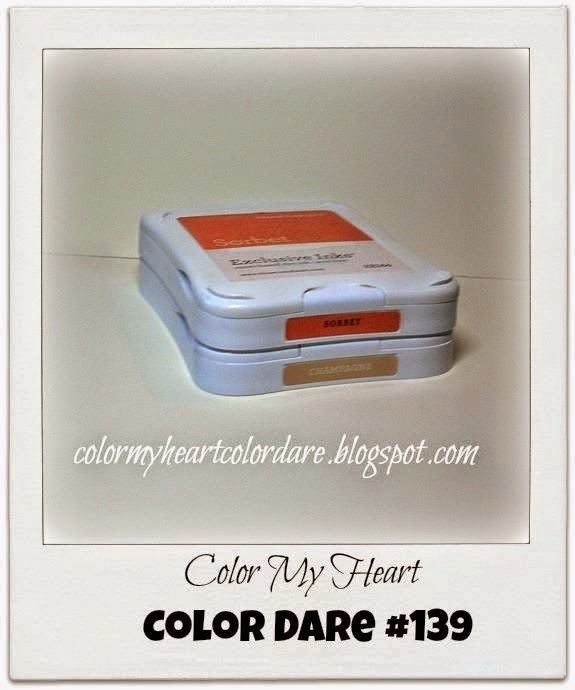 The new Color Dare for this week from Color My Heart Color Dare Challenge uses just two colors, Sorbet and Champagne. Make It From Your Heart Vol. 2 page 46 pattern 28 basic layout. Art Philosophy Cricut cartridge to cut the card. Artbooking Cricut Cartridge to cut the 3 nested shapes starting at 3" in Champagne, 3 1/4" in Sorbet, 3 1/2" in Champagne. 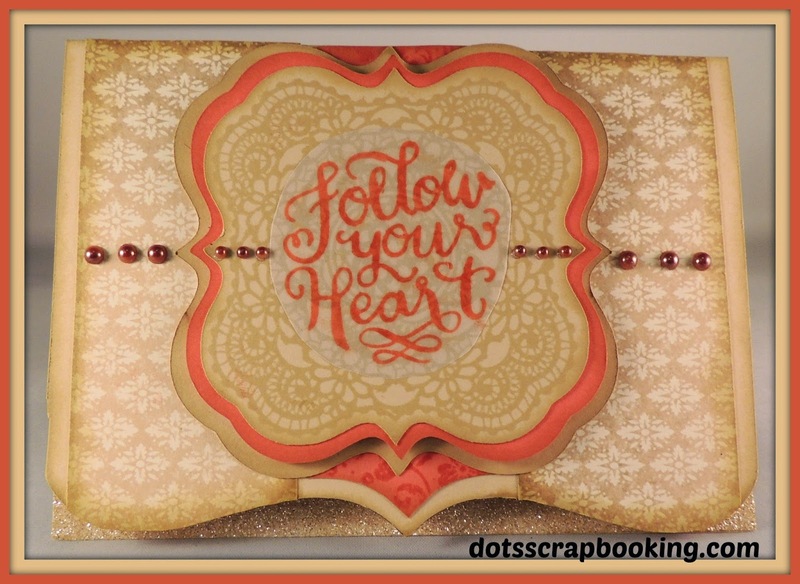 The lacy stamped image was from D1571 Sweet and Lovely stamp set that comes in the Artbooking Cricut Cartridge bundle. It was actually the inspiration for the card. The little strip of bling to make the lovely curve of the card "pop" is a 5 1/2" piece of White Shimmer tape that was colored by dabbing Champagne Ink Pad with a sponge dauber. Sorbet Ink Pad onto vellum, allowed to dry and adhered with a Bonding Memories Dual Action Glue Pen which dries invisibly. All of the edges of the pieces were sponged with Champagne Ink Pad with a sponge dauber. I am very happy with the colored shimmer trim. 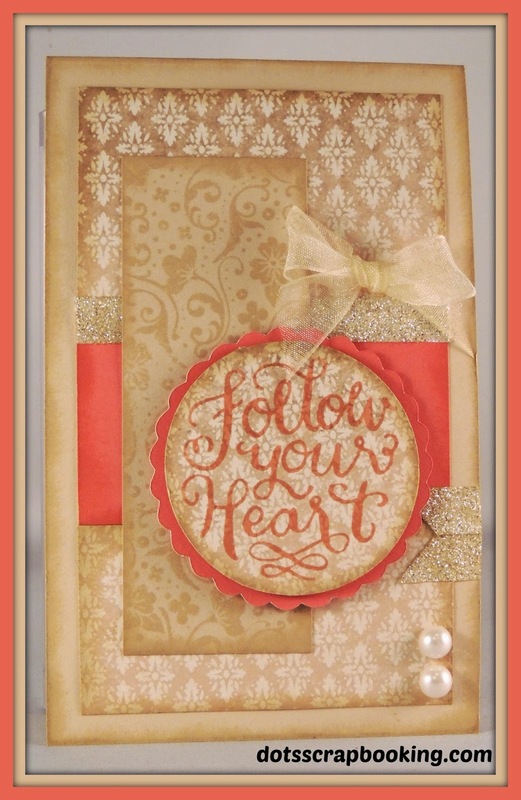 Using the White Shimmer tape you can coordinate your creations with all of Close To My Heart's wonderful inks. How FUN is that!! Such a pretty vintage feel to this card! Thanks for playing along with Mojo Monday! Thank you! It's great to work with a sketch! Love the fact you used the Yuletide paper ~ beautiful. Thank you for playing along this week with Color My Heart this week. Wow, these are so elegant and pretty! 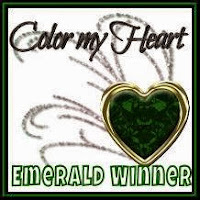 Thanks for joining our challenge at Color My Heart Color Dare. Beautiful cards. I love all the layering you did on both of them. Thank you for inspiring us at Color My Heart Challenge Blog. Easy Cards and My Hubby was Framed! !